Okay, so day one is under our belts. Very interesting day here at VMworld 2016. We opened the show this morning with a Facebook Live that can be found here. Each morning, we will be doing a live broadcast about the upcoming events for the day. If you would like to watch it live, go to the link and make sure to turn on live notifications and you can see what we are up to for the day. You can see it each morning at 10am PT. Today we had over 750 people visit our booth and provided them with a host of presentations and demonstrations. The biggest sentiment from the show floor today (and last night) was “Wow”. One of our new SE’s said, “the biggest word I hear from prospects is, ‘simple’”. The management of the system is so simple it is really hard to believe. 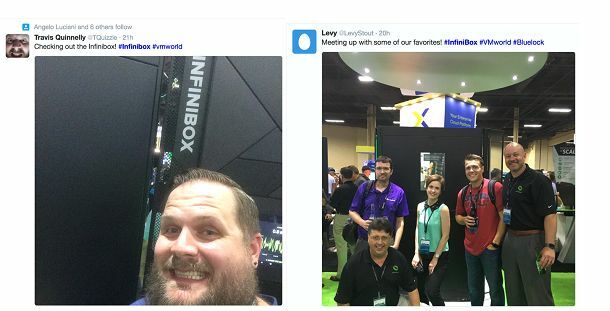 We had three INFINIDAT customers present in our booth today. The first one was DSW, a branded footwear and accessories retailer, Bluelock, a Disaster Recovery-as-a-Service cloud provider and a large insurance company. Each one of these customers spoke for about 15 minutes and told their story of how INFINIDAT help them to accelerate their businesses. Here Matt Rademacher, Infrastructure Architect told us that the ease of use of the array was amazing. He provided us with some statistics. Another interesting topic that has come up all over the show floor is cloud. It seems like every conversation someone asks “what is your cloud strategy”? We have sold InfiniBox to a number of service providers and one of our latest is Bluelock. They spoke in our booth today about their experience with INFINIDAT. Next Ken Newell, Storage Engineer told the audience that as a storage service provider they really need to ‘partner’ with their vendors. He said he was impressed with INFINIDATs “willingness” to dig deep and engage with other vendors”. He specifically called out an issue that happened between VMware SENSE issue that we were able to help him resolve. Lastly, our special guest, a large insurance company gave a special presentation. While I can’t blog about them, if you come by the booth, they are telling their story every day and it is real exciting. Missed these sessions today? Don’t worry, you’ll have another chance to catch them at the booth tomorrow. Go to this page to see the schedule. 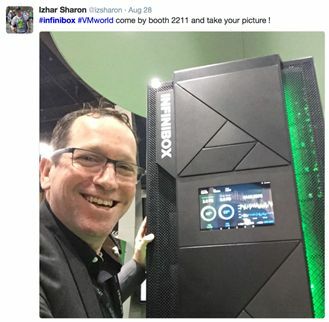 To help them understand how we are faster than flash for real world workloads, Technical Director, Aviad Offer, presented the architecture behind the InfiniBox solution that makes it faster than all flash arrays for both reads and writes, and that is the key. 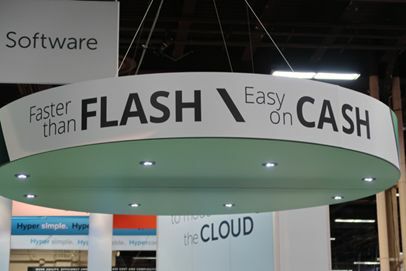 During the last 18 months and especially here on the show floor, we have heard a lot of talk about all-flash storage. So if you want to know how you can save three quarters of your storage budget but get the performance you need to run your business, I encourage you to come by the booth, #2211, to hear more about how InfiniBox can provide #allflash performance with 99.99999% availability, at up to 2.76PB of capacity in a single 42U rack. So there is the summary of what happened today. To hear more of what is coming tomorrow, please see our Facebook Live stream tomorrow morning at 10am PST.